Johnson City, Tennessee is approximately sixty miles from Asheville, North Carolina a comfortable, hippie chic town. Johnson City is better described as quaint, more conservative, but we discovered, particularly in the older, original segment of town, unique antique stores, memorable signage, and some architectural gems. No secret, auctions presented by Kimball Sterling are social events with art and food as focus. During the previews, finger food and fiddling provide a down home hospitality. Invitations are also forthcoming for parties with barbecue and all the fixings from the auction house's robust namesake. The real show begins on Saturday morning with coffee, particularly for those who may have imbibed the previous eve. We have taken part in the over nights as well as day trips with early morning departures and late night returns. One such auction we previewed the work of artists Tino and Carole Ferro. 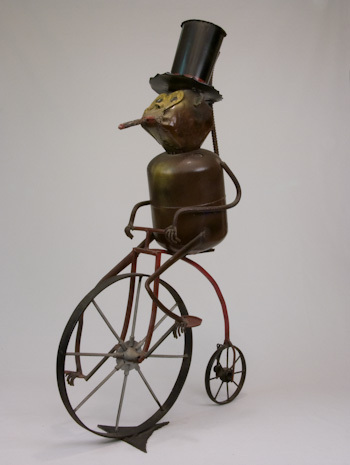 We had never seen nor heard of them or their imaginative, collaborative metal sculpture. Self-taught artists, they reside in Preble, near Cooperstown, New York. Some of the materials they incorporate in their sculpture are re-purposed, others welded, forged, or bent as their imaginations lead them. One piece we viewed was a spry pig with goggles riding a motorcyle. It got our attention but the piece we then saw and later that afternoon "won," was a chic-y monkey with top hat and cigar pedaling a bicycle. 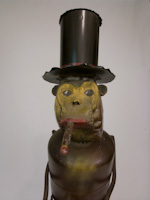 The body of the monkey, a re-cycled propane tank, his appendages and tail were made from segments of construction re-bar. We continue to enjoy the work of Tino and Carole Ferro for it's witty charm.